A local woman hawks delicious mantou, various kinds of steamed buns, a cheap and filling food extremely popular with foreigners. Is this food heaven? In many ways, yes. If there is anything that the foreigners universally love about Taiwan, it's the magnificent food. A fruit seller displays his wares at night. Bananas, oranges, tangerines, local and imported grapes, papayas, melons, apples and peaches, cherimoyas, pears and other goodies are common even at the smallest fruit stands. Taiwan, and Taipei in particular, has excellent Chinese food, of course. Cuisines from every part of China are represented in the major cities and there are restaurants to suit any pocketbook A butcher in a traditional morning market. Like all cultures, the Chinese borrow freely from abroad and fusion dishes which utilize non-Chinese ingredients such as cheese, ketchup or mayo are common in larger restaurants. There are also a plenty of weird restaurants, like this toilet bowl-themed place a friend of mine alerted me to. Not for the faint of heart: abalone drowning in mayo paired with fried honeybees. Fish for sale in a local fish market. There are so many wonderful places to eat that I couldn't even begin to list them all. Many places advertise in the local English paper. In addition to individual eateries, there are also specialized streets for certain types of food, such as the beef noodle street in the railroad company compound just north of the main Post Office in Taipei, whose establishments offer up some of the best beef noodle on the island. A vendor prepares a kind of steamed sticky rice treat wrapped in banana leaves. Your friends will be able to tell you which restaurants are good locally, but a sure sign is a place that is packed at meal times. A street vendor feeds a family breakfast on a cool winter morning. It used to be that there was a lack of foreign foods and foreign restaurants, especially outside of Taipei, but this has changed. Western style restaurants are everywhere, though naturally their cuisines are modified to suit local taste buds. A small Japanese restaurant in a small southern Taiwan town. As Taiwan slowly and painfully globalizes, more and more foreign food places are appearing. A large restaurant on a mountainside near the resort town of Hsitou. A shopowner prepares a serving of "ba wan," a hugely popular local delicacy. Made of sticky rice dough stuffed with meat and fermented bamboo shoots and served with a sweet or hot sauce, ba wan are a not-to-be-missed treat. Dining at your local street vendor's is probably cleaner and safer than eating in many large restaurants (certainly more so than any local chain). Many large establishments routinely violate good culinary and hygenic practices and items such as utensils, plates and napkins will often not be adequately washed and cared for. A fruit wholesaler in Taichung. Note the scooters on either side of the street going in the same direction. Mass food poisonings happen from time to time and large international hotels are sometimes busted for unsanitary conditions. Since payoffs are a way of life in the food trade, there is little regulation of the industry. Dried mushrooms crowd the shelves of a volume retailer. On the other hand, the average vendor or family-owned restaurant prepares the food right in your view. You can pick side dishes yourself and are served on disposable plates with wooden chopsticks. Food is boiled constantly and the risk of food poisoning is lower. The food is usually better too. A mighty feast held at a local restaurant. Do not buy processed foods like flavored tofu, preserved fruits, and so forth in the local market where they are kept in large bins in the open. The preparation and storage of such items are frequently not in compliance with health regulations. Instead, buy pre-packaged foods in your local supermarket from recognized national brands. French bread aligned in neat rows in an upscale local bakery. In large cities such bakeries are common. 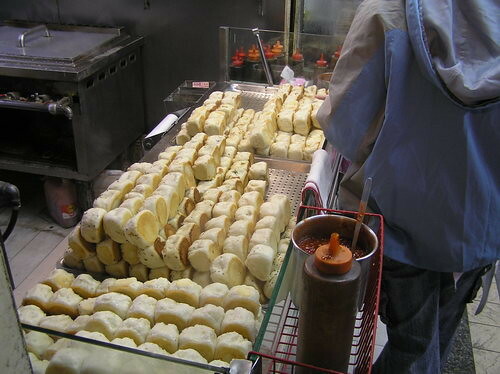 Fried/steamed buns sold in a Taipei shop. For vegetarians Taiwan poses no problems. My daughter marvels at the selection of vegetables. There are two distinct types of vegetarian cuisines available. One is just vegetables, tofu, and so forth, what we would think of as vegetarian cuisine in the West. The other, however, is an invention of Buddhist chefs and uses vegetable materials to imitate the flavor and texture of meat, with superb results. A food vendor fries up breakfast. Many Taiwanese are vegetarians and vegetarian cuisine is widely available in the cities (our perfectly ordinary middle-class neighborhood in Taipei had two veg restaurants). When you work you can always get the standard lunchbox meal, the famous bien dang, in a vegetarian version. No one considers vegetarianism unusual or even worth remarking on. A sign partly in English and German advertizes European-style ice cream. One problem: in ordinary restaurants vegetables, especially greens, may be served sweetened with pork fat or with ground fatty pork. Just because it's a vegetable, doesn't mean it's vegetarian. Thus, if you order greens, make sure you get them without anything on top. A random vending machine, somewhere in Taiwan. The lack of caffeine and sugar-free drinks is a serious one in Taiwan. Additionally, many breakfast places fry their stuff in lard for its superior flavor and crispiness. You can check this by looking at the oil as they pour it into their frying pans. If it is whitish, it is probably lard. The riches of a small vegetarian buffet restaurant in Taichung. If your school sends out for lunches or dinners for you, they are typically happy to order a vegetarian meal if you tell them you prefer that. A dinner from a buffet place offers cauliflower, greens, bean sprouts, eggplant, and fried vermicelli, plus soup and a sweet drink. The rice is $10 extra. Total cost: NT$50 to stuff yourself on delicious veggies. Milk is expensive here. A common problem is that much of the "milk" sold in Taiwan is actually reconstituted from powder, especially in smaller groceries and markets. If you are a milk person, purchase name brands from 7-11 or larger, more modern supermarkets. A pastry shop on a university campus. And beware: several brands (including the 7-11 house brand, President), cut their 2% milk with sugar to make up for the lack of sweetness due to the reduced fat. Local yogurts also tend to be made from reconstituted milk powder. This brand doesn't cut the low fat milk with sugar. The delicious, ubiquitous Pearl Milk Tea is generally made with powdered tea and "milk" -- the milk being vegetable oil creamer rather than a diary product. If you are picky, be sure that your Milk Tea comes from a vendor who uses real milk (there are many). There's more fried chicken at McDonald's in Taiwan, and no quarter-pounders. Common rip-off: some vendors will deliberately attempt to give you the smallest piece of whatever they are buying, especially if you are a regular customer. The best stuff is reserved for new customers. The logic is, if you're a regular, you've been captured, so why should they bother to give you the good stuff? The remains of New Year's Dinner lie strewn about the table. For example, I used to be a regular customer of a certain lunch vendor who sold pork chop rice, a common lunch. If the owner served me, I got a whole pork chop plus a chunk of another one. If the wife served me, she rooted through the stack to find the smallest pork chop, and gave me that. I have had this experience at vendors all over the island. <sigh> A water station in a neighborhood. Here you can buy potable water. A vendor prepares noodles early in the morning. Preparing food at home is often more expensive than eating out cheap. This is because supermarkets are not allowed to sell at wholesale prices, competition is regulated by informal agreements among retailers (for example, department stores alternate sales so they don't compete against each other) and various other factors (organized crime, high demand, etc). Our butcher smiles proudly in front of his shop. We buy from him several times a week. He and his wife are wholesalers who make their main living selling to local markets, but as a service to locals they offer high quality fresh meat to the neighborhood, for which we are very grateful! Their workday begins at 2:00 am. Food prices can be staggering in the supermarkets and traditional markets in some areas (prices also vary widely across major cities). Older sellers of veggies are often cheaper than younger, since they maintain the prices of a vanished generation. Here's a stroll through a traditional morning market. To get good prices, it is best to become the established customer of a vendor. A fruit stand in a small local market. Fruit from stands like this is generally much more expensive than fruit in the volume retailer stores like Giant or RT Mart, or large, specialized fruit sellers. I would avoid supermarkets entirely. Purchase at either local traditional markets or from volume retailers like Costco or RT Mart. Prices are significantly higher at supermarkets. Moreover, expired foods are often repackaged. In tradition markets, the food is right in front of you, and its quality can be easily ascertained. Of course, shopping in the traditional market is more fun too. Locals name their choices at a local night market. Night markets make excellent, if calorie-filled, outings for adults, kids and couples. Cheating is common in the local markets, but most purchases will be OK. Cheer up! It's not just foreigners who get ripped off -- the Taiwanese cheerfully abuse each other as well. The implements of creation await customers. A store selling local specialties in Hualien. It is traditional in Taiwan that if you take a day off work and travel, you must bring back some local goodies for your coworkers. Note the television; Taiwanese lives revolve around the TV. One way to avoid market rip-offs is to pick the food out yourself. If you permit the vendor it pick it out, they might dump off rotten food on you. A display of side dishes in a restaurant. Everything grown must be washed thoroughly. The growing organic movement here (stores in every neighborhood, prices in the stratosphere) bodes well for the future, but Taiwanese fruits and vegetables currently have extremely dangerous amounts of pesticides. A quick lunch at the in-laws' house: tilapia in chili sauce, duck, chicken, pickled cabbage, tofu. See my water page for details on the local water. How people stay so thin eating this I will never know. Thanks to additives in tofu, the brain cancer rate for vegetarians is ten times that of meat-eaters. Animals are pumped up full of antibiotics and drugs before being slaughtered and conditions are not exactly sanitary. In other words, whenever possible, buy imported foods. Also, ordinary salt often DOES NOT contain iodine. Be sure to buy iodized salt. It will say so in English on the label. A roadside fruit vendor. Despite the informal air, prices will not be lower here. The "whole wheat" flour in Taiwan is not whole wheat as we know it back home. Taiwan has no flour mills capable of producing genuine whole wheat flour. Rather, the wheat is processed into ordinary white flour and then the stuff that was removed in the processing is mixed back in to make "whole wheat." Purchase imported stuff at your local American grocery if you are picky. Buying tomatoes from a vendor in front of a local temple. A problem that recently came to light is the use of reconstructed meat in local steak houses. Although the chains advertize that they sell steak, in fact meat sold in the cheaper steak houses is often processed, restructured using soy protein and food glues, and then pressed into the desired shape. A woman hawks drinks in a night market. A fancy lunch for the faculty at our university. The food served at these gatherings is generally bland and stereotyped. I'd rather have a decent bowl of beef noodle any day of the week. Sooner or later you will tire of eating the local food and want something else. The major cities all have Western groceries and international restuarants. 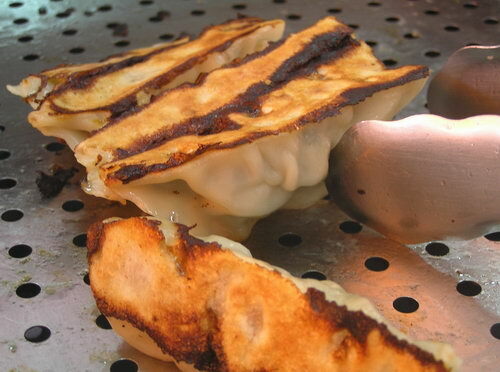 Potstickers, a favorite of westerners for breakfast and lunch. Starbucks is found in all the major cities, with 150 outlets in Taipei alone. A bakery selling Chinese versions of Japanese versions of western baked goods. There is a tremendous variety of Western food available, especially now that the US retailer Costco has open outlets in Taipei and Kaohsiung. Additionally, western snack foods such as Nabisco and Frito-Lay offerings are available in all convenience stores. Some even sell mass-market picante sauces, although these are not popular, since the Taiwanese typically reject spicy foods. Diners crowd a local eatery. In Taiwan, there are Italian restaurants in every city. Excellent Vietnamese and Thai food are available. Steak is a way of life in Taipei. Japanese restaurants may be found on every corner. Many small foreign eateries thrive around National Taiwan University catering to overseas Chinese and foreign students. Indian, Mexican, Morrocan and Arab places have opened in Taipei. In Kaohsiung, down by the docks, there are many excellent, cheap eateries that provide home cooking for the foreign sailers. My wife contemplates the buffet at a local steakhouse. Of course, there is always fast food: McDonald's, Wendy's, Subway, Burger King, Sizzler, Ponderosa. Many foreigners find themselves eating at McDees far more often overseas than they do at home. A seafood restaurant displays meal possibilities to its customers. Outside of Taipei McDonalds, Subway, Dominoes and Pizza Hut will often be the only affordable western alternatives. Because of the large numbers of foreign laborers from SE Asia and Indonesia, even the smallest hamlets might sport Indonesian or Thai groceries, as well as Thai and Filipino cantinas serving great home-style food. Barbecue, popular the world over. Certain things are unobtainable except at high prices. Despite bakeries on every corner, decent bread (other than Wonder-style sponge crap) can be a pain to find, but now even medium-sized towns will offer quality bread somewhere in town. In recent years, bland, low-quality mass-market western cheeses have been making their way onto the shelves of even small local supermarkets. Eating at Second Aunt's 60th birthday party. Family gatherings the world over are exactly the same. A genuine coffee culture is springing up and specialty coffee shops are appearing in the larger cities. A stand at a highway rest stop. The selection of fruits and vegetables has been improving in recent years as new products hit the market and restrictions on imports are relaxed. Large retailers will often have many different kinds of fruits available, and a much larger selection of greens and veggies than American supermarkets. A vendor offers shaved ice treats -- sweets and sauces over ice shaved off of a huge block. The lack of dairy and low fat in such desserts helps keep locals thinner than the pachyderm-class Americans one commonly sees. The traditional markets are filled with fruits and vegetables. Although limited by seasonality, a large variety of things is available, expanded rapidly in recent years. Good things to eat on a street corner: crab, fish, octopus, squid. Come! The oil awaits! Fortunately there is now a variety of foreign ice creams such as Haagen-Daz, Dove, and Dreyers. A "hamburger" place sells breakfast. Taiwanese sell two kinds of breakfast, Chinese and "Western." The Western style consists of a "hamburger," a sandwich with various things like dried shredded pork, corn kernels, cucumber, a fried egg, mayo, and other stuff layered Club sandwich-style on three slices of bread, with the crusts trimmed away. Needless to say, we don't eat anything like that for breakfast. Like American Chinese food, it's a purely local culinary invention. As for local chocolates, you'd be better off knawing the melted ends of old scented candles. Luckily there is a plentiful supply of medium-quality imported chocolate (Hershey, Dove, Cadbury, along with some European and Japanese brands). Recently dark chocolate has become popular, and it is now available in every convenience store on the island. A group of vendors operate a small sidewalk stand. Generally the vendors pay rent to whoever owns the building in whose front the sidewalk sits, though technically such space is public land. Taiwan's rapidly changing economy, in which firms are growing relatively larger and opportunities for small manufacturing waning, has resulted in many former small factory owners opening roadside stands. Good wines are getting easier and easier to find, but they'll set you back apiece. Liquids labeled "wine" are widely sold in supermarkets and convenience stores. Sausage vendors ply their trade in a small Taiwanese town. Imported beer, including Corona, Heineken, and a variety of Asian brands, can be found in any convenience store. An upscale Japanese-style buffet restaurant. A butcher in a morning market. Kitchens are nowhere near as well-equipped as incomes would seem to predict. The low quality of kitchens is hard to square with the importance of food in Taiwanese culture (but may have something to do with the overwhelmingly male architect population). Kenting has a complete collection of overpriced restaurants catering to the backpacking circuit. The oven situation was once grim. However, ovens are now sold everywhere. In Tienmu in Taipei there is housing catering to foreigners which has Western-style stove/ovens, and newer developments sometimes have western-style kitchens. The definitive Taiwanese dish: scrambled eggs with oysters, being prepared in a night market. Corn starch supplies the clear white color, and the dish is served with a tangy sauce. Cheap, large countertop ovens are now widely available, retailing for less than NT$2,000. Oursmall countertop oven like this goes for NT$1,800 and does a homemade pizza just fine. On the plus side, cooking is done with gas. 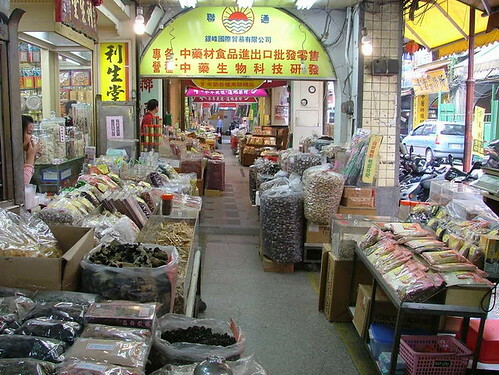 Nearly all spices, herbs and baking materials are available, if not in your local supermarket (which is often surprisingly well-stocked) than on Tihua Street, in Tienmu or at one of the supermarkets down by the universities. You should be able to find everything once you are familiar with the local area and nearby cities. If you are a serious non-western ethnic cook, especially Indian or Mexican, I suggest bringing a large supply of difficult-to-find spices from home (ground coriander, fenugreek seeds, black mustard seeds) to tide you over until you can locate them somewhere in Taiwan. Italian or french cooks will have little trouble finding the things they need, though some ingredients will be pricey. Many ordinary Western spices are considered medicines in China and you can find such items as fennel and cinnamon at your neighborhood Chinese medicine store. Consult your dictionary. My daughter garbages up at a restaurant in the mountains above Taichung. 2 / F, NO : 137, Chung Shiao East Road, Sec 5, Taipei,Taiwan. MRT station : Taipei City Hall MRT Station,Exit # 4, Two Minutes straight walking. Frogs await culinary enthusiasts in a local market. However, bulk spices are widely available now. In Taipei Tihua Street, the spice and cloth retailing street, has a plenitude of Western and Indian spices (my page on Tihua Street). Many supermarkets will also carry a range of Thai foods, and near industrial districts there are typically supermarkets catering to workers from the Philippines, Thailand, and eslewhere. Spice shops on Tihua Street. A large evening market in a small town. Morning and evening markets fulfill the supermarket role; night markets are for snacks, entertainment and clothing. 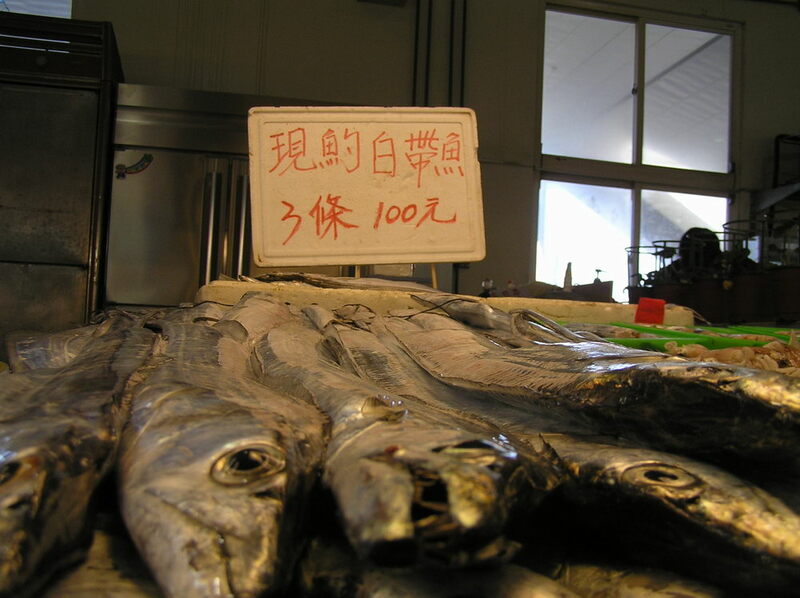 Taiwanese have their own cuisine, of course, which dominates outside of northern Taiwan. They also love Japanese-style foods. Sushi and sashimi are inexpensive, popular and widely available (the small-town market in the pic above boasted four sashimi dealers). Specialty of the house.... Taiwanese cooking is heavy on the fats and based on rice, fish and vegetables. Dairy products are not used, except where Western influence is heavy. Need instant noodles? Here they are.... Only a few spices constitute the core of Taiwanese cooking. Local foods generally being sweetened with fats (the preferred flavoring is pork fat) and spiced with anise, soy sauce, salt, ginger and black pepper. Many dried or fermented objects, such as miniature shrimp and fish, fermented beans and dried plant parts, play the role of herbs and spices in other cuisines. Large amounts of oil are preferred. Heat is supplied by chili pepper (Taiwanese generally do not like hot foods, and the foods they describe as "hot" usually have little kick). Part of the collection of American-label products at the box store in Kaohsiung. It is a fairly healthy cuisine, or would be if the food was of higher quality. The relative healthiness of the cuisine, the smaller amounts of food eaten and the dearth of dairy products are what keep Asians thinner than Westerners. Taiwanese children in the current generation, raised on milk, candy and meat, are starting to look like American kids, however. Mr. Mark, a European-style bakery chain with downtown outlets in the larger cities. The influx of mainlanders in 1949 brought a wide variety of wonderful foods to the island (probably the only good to come out of the whole sad affair) and the wheat-based dishes of northern China are cheap, widely-available and popular with foreigners. Sacks of rice piled in a volume retailer. They are less common in the south, where Taiwanese cuisine tends to prevail. Sadly, many of the traditions are being lost, as western influence grows, processing becomes mechanized, and individuals have little time, money or inclination to cook. Pizza delivery, Taiwan-style. Chinese cookbooks are cheap and widely available, many translated into English (some by my wife, who makes a living doing that). I also suggest buying a copy of Eating with Chinese Characters, an entertaining and useful book about ordering Chinese food.